If you can believe "GTA 5" tipster NillxModz, then the highly anticipated "GTA 5" Heists Update release date is on Tuesday, Dec. 23. In fact, NillxModz claims that the DLC will be available on Sony PS3 and PS4 consoles starting Dec. 23, 5 a.m. eastern. However, the Heists update will not reach Xbox 360 or Xbox One until 10:30 a.m. eastern. Apparently, PlayStation gamers will get to enjoy GTA Heists a few hours earlier than Xbox users. There is no specific explanation as to why PlayStation will receive "GTA 5" Heists Update sooner, but "GTA 5" tipster and YouTuber DomisLive suggests that the time difference could simply be down to the way Sony and Microsoft servers schedule the DLC updates. Past speculations have already suggested that the "GTA 5" Heists Update and Holiday DLC would be released on Dec. 23, the Tuesday ahead of Christmas Eve. Unfortunately, we cannot verify NillxModz's information regarding the specific PlayStation and Xbox release. However, expect Rockstar Newswire to finally release some detailed Heists and Holiday information in the days ahead. • 23rd December 2014 (PS3 and PS4) @ 05:00AM. • 23rd December 2014 (Xbox 360 and Xbox One) @ 10:30AM. You can expect to see the Heist DLC and Holiday DLC (1.05/1.19) for all consoles on Tuesday 23rd December 2014. Look forward to it! Speaking of our dependable "GTA 5" tipster DomisLive, YouTube has just terminated his YouTube channel moments after he uploaded a video regarding Holiday leak information on Friday afternoon. According to YouTube, the DomisLive channel is "terminated due to repeated or severe violations of our Terms of Service." What's more, NillxModz announced on Twitter that Rockstar has banned his PSN account from "GTA" Online as well! Is Rockstar trying to stop DomisLive and NillxModz from releasing anymore Heists information? Based on the information gathered from DomisLive's final video before the ban, "GTA 5" will receive a selection of new items in themes for the Holiday DLC. 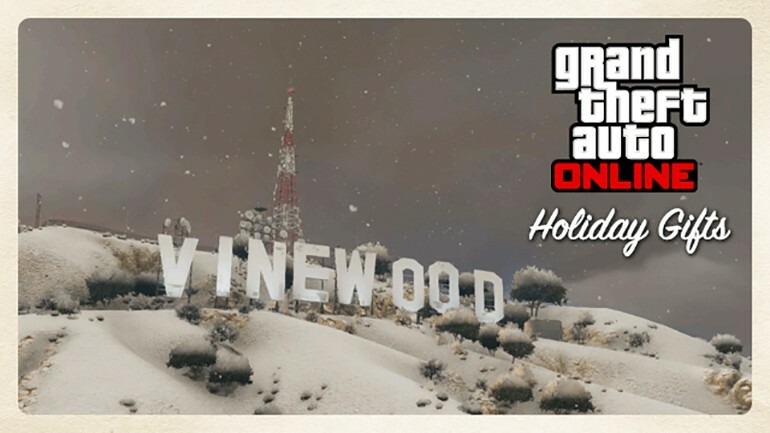 Based on the information, the upcoming "GTA 5" Holiday DLC will include Gradient Controlled Snow, which suggests that the severity of the snow storm can alter for a more realistic representation of weather patterns on the next-generation PS4 and Xbox One consoles. Oddly, a Red Sky mod will be included in the update as well. Next, a total of 8 Christmas-themed clothing items will be available, including scarves, t-shirts, suit jacket, pumps, and suit trousers. Also, the apartment interiors will get a little splash of flair as well, although we are not certain whether or not that includes a decorated Christmas tree. 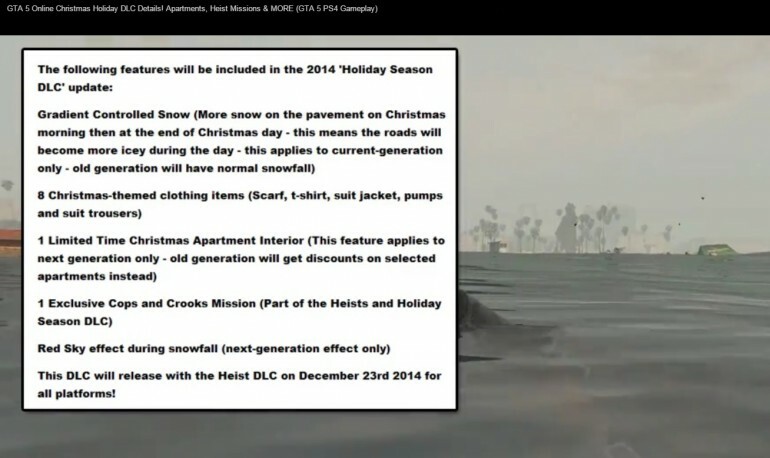 Finally, we know that the Holiday DLC will coincide with the Heists Update, also known as Cops n Crooks. Given the combination, we are excited to see how heist missions will play out while the city of Los Santos enjoys winter flurries! Obviously, there are still details regarding "GTA 5" Heists Update and Holiday DLC that we have yet to learn. However, now that DomisLive's YouTube channel is terminated, it will definitely be more challenging for us to deliver the most relevant "GTA 5" update information. Stay tuned as we learn more about "GTA 5" Heists as well as the status of DomisLive's account in the days ahead. My Youtube account has been terminated, I'll contact my network and find out what happened.